Netting is an old crafts technique basing on the nets that fishermen have always worked. For decorative netting a different, but similiar Knot is used. When netting doilies in the round the pattern is worked at the same time as the ground. Patterns are done by working several knots into the same loop (shell stitch) or by gathering several loops with one single knot. Loops can be twisted or crossed when being worked into to get more patterns. Another possibility of patterning is using different lengths of loops. Classical Netting, also called Filet Lace, embroidered net or Lacis is worked in two operations. First the ground is netted in rows going back and fourth. This is very tedious, because no patterning is done at that stage. After that the ground is stretched over a frame. Then the pattern is embroidered onto the ground. There are several different stitches for doing so, and different weights of thread can be used for the embroidery for shading. Embroidered net worked in only one stitch and with one weight of thread can still be very impressive. 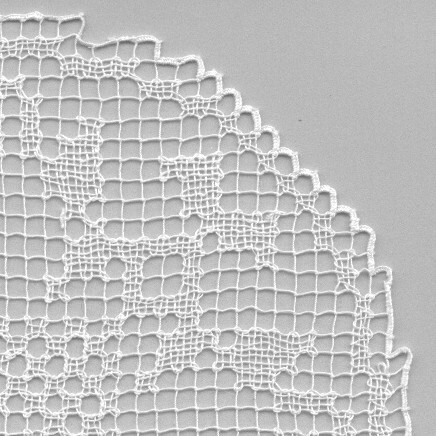 Filet Lace is sometimes put into the group of the Real Laces. Today the crocheted imitation of Filet Lace is better known than the real thing, which is much finer than crocheted filet. Filet is very delicate, because the size of only one thread makes the basic element of the work, not several as in other lace techniques (crochet = 4 threads - loop inside of loops; tatting = 2 threads - knots over a central thread, bobbin lace = 2 threads - a twisted pair of threads). It is only knots that keep the single threads together. This makes starching a necessity, so as to keep the form of the lace. On the photo you see one netting needle without thread, the other with thread is shown from the side. Netting needles come in different sizes. The other necessary tools are netting sticks, over which the loops are worked. Only by using netting sticks as gauges a regular size of the loops is garanteed. Today the sticks are made from plastics, but they can also be made from wood, bone, ivory or metal. Even knitting needles with two points can be used for netting sticks. This Photo shows my first doily netted in the round that turned out better than a heap of knotted thread. It is a very simple doily, since there is almost no pattern. It is almost exclusively worked in straight stich (one stitch in one loop). It is still a bit irregular, and I have to practice a lot still to make really nice even netting. It was fun to work the doily, and it didn't take very long in spite of my beginner's slowness of working. The diameter is 21 cm, and the doily is worked with a no. 20 thread. You can clearly see the knots which are sitting in the center of the loop of the previous row. It is not only doilies that can be worked by netting in the round, but also useful things like nets used for storing balls or for tote bags. 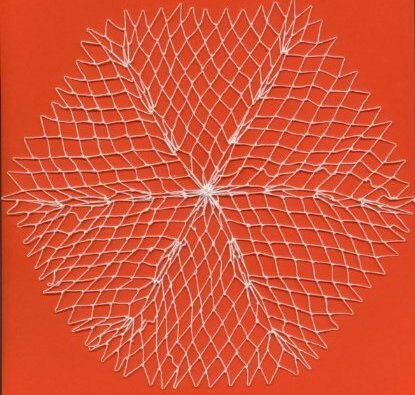 This is an example of a doily worked in Classical Netting. I didn't work this doily, but bought it at a junk shop in Berlin. Erikas Handarbeiten, Bd. 81, Modernes Rundfilet, Rinteln, n. d. (about mid-1950s). 13 Doilies of different sizes worked in netting in the round, one collar. With how-to instructions. Good variety of patterns. Out of Print. Erikas Handarbeiten, Bd. 82, Modernes Rundfilet, Rinteln, n. d. (about mid-1950s). 12 Centerpieces and Doilies of different sizes, no how-to instructions. Out of print. Lang Heft 86, Filetknüpfen, Reiden (CH), n. d. (about mid-1970s). Very good instructions on how to work all different kinds of filet, lots of photos. 35 different Projects, 17 of them in netting in the round, some in combined techniques. Text German and French. Still in Print. Burda Anna. Magazine, published in English and several other languages. Once in a while they publish something on filet/netting. The following issue had filet/netting: March 1982, April 1983, January 1984, May 1984, February 1985, March 1993, March 1994. Always nice patterns, most of the time they give at least a short how-to class. Netting by Rita Bartholomew is thesource on the net on the topic. You will find instructions on all kinds of netting, two different knots, lots of patterns, which can be combined into lots of doilies, and some full patterns of doilies. Avital's Page has photos of doilies she worked.